Pre-orderers can get a preview of the new South Pacific archipelago. 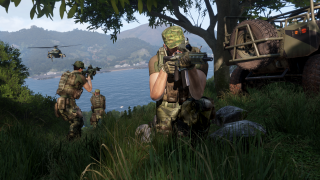 As part of the PC Gaming Show today, Bohemia Interactive confirmed a release date for Arma 3's first expansion, Apex, which will be out July 11. Apex adds a new 100 square km map—the South Pacific archipelago Tanoa—new weapons and vehicles, and a co-op campaign, among other things. Everyone who's pre-ordered Apex will get access to a sneak preview that includes everything except the co-op campaign (accessed via a Steam beta branch for the game). Check out the swampy new trailer above.